Ham and bean recipes are versatile and inexpensive. If you find yours is too runny, you have several options for making it thicker. Try adding breadcrumbs, cream or pureed vegetables to make a heartier ham and beans. If you don't have any extra ingredients, you can add a vegetable-based starch. Cornstarch will thicken your meal without changing its flavor. Heat up your ham and beans on the stove top. Decide how much thicker you want them to be. One way to decide is to look at what level the ham and beans come to on your pot. Decide how much lower the liquid level of it should be. Reducing the liquid by half will lower the ham and beans level in the pot by half. Reduce the heat of your ham and beans to medium. While it cools slightly, add the cornstarch to the cup of cold water. Mix the cornstarch and water together. Cornstarch will not thicken until it is heated. Drain excess fluid from the ham and beans if you are planning on making a much thicker recipe. Adding cornstarch to a very watery meal will not get rid of excess fluid, only thicken fluid already in the pot. Do not get rid of too much fluid, or else the cornstarch will not swell enough when added. Add a little bit of the water cornstarch mixture to the recipe while stirring. Cook for 30 seconds to a minute, watching the thickness of the ham and beans. If it becomes thick enough, then take it off of the heat and serve. Otherwise, keep adding a little of the cornstarch mixture at a time until you achieve the right consistency. Use cornstarch, potato starch or tapioca starch to achieve a glossy, satiny appearance. Cornstarch has the benefit of being wheat- and gluten-free. Cornstarch may not work as well in meals which are very fatty, sugary or acidic. 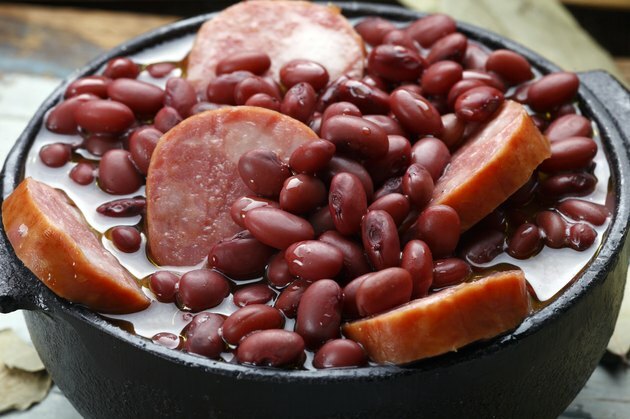 Excessive cooking or stirring may damage cornstarch integrity and cause your ham and beans to thin out.